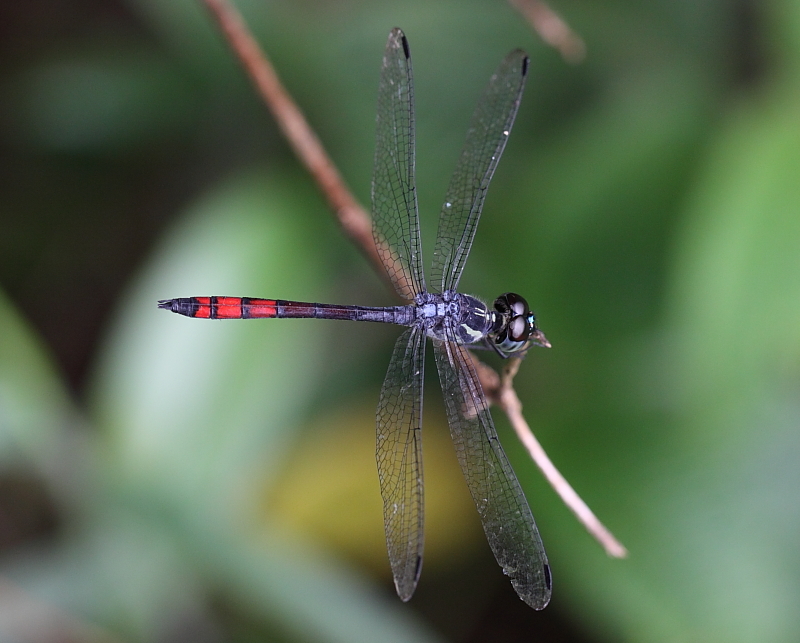 This species has been listed in the Singapore Red Data Book as critically endangered species. 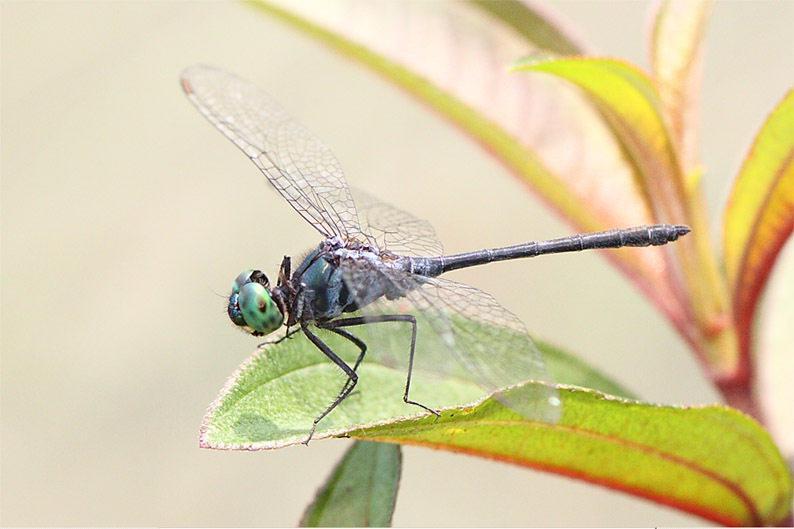 It is classified in Mr. Tang’s book as a Rare species which occurs in open marshes with emergent plants. 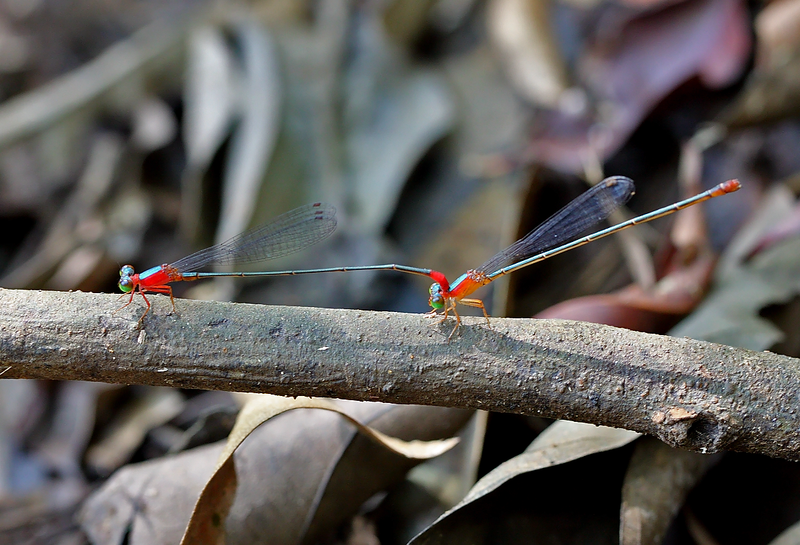 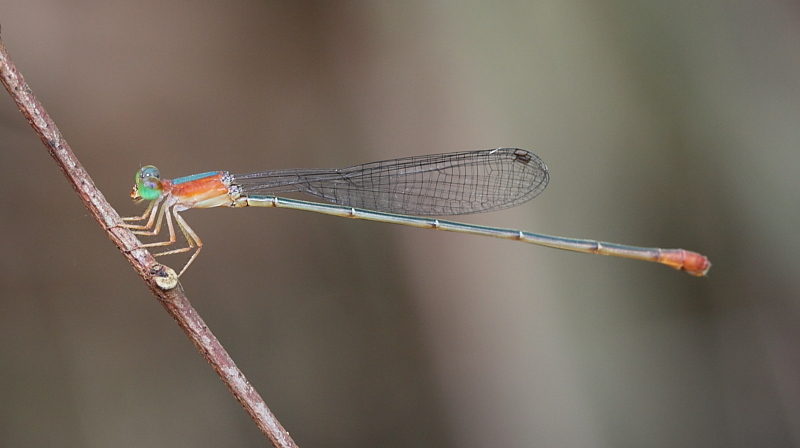 So far, I have seen this species only at MacRitchie reservoirs. 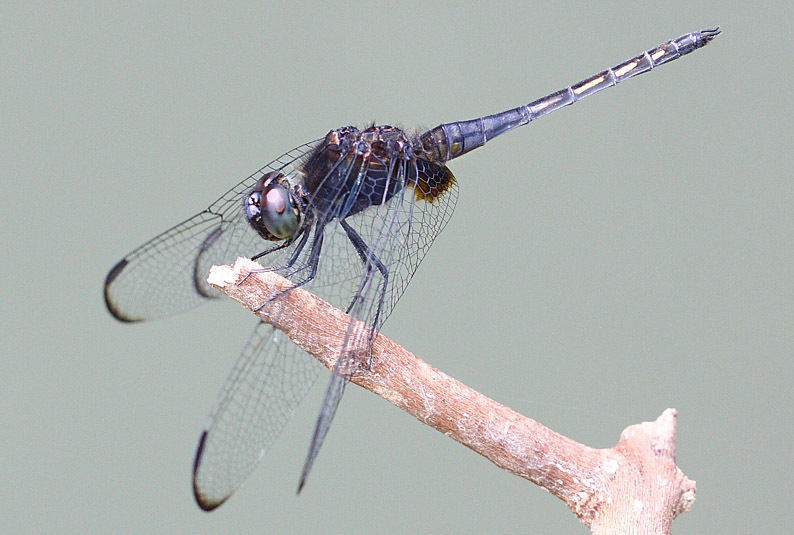 Generally, the male of this species is quite dark. 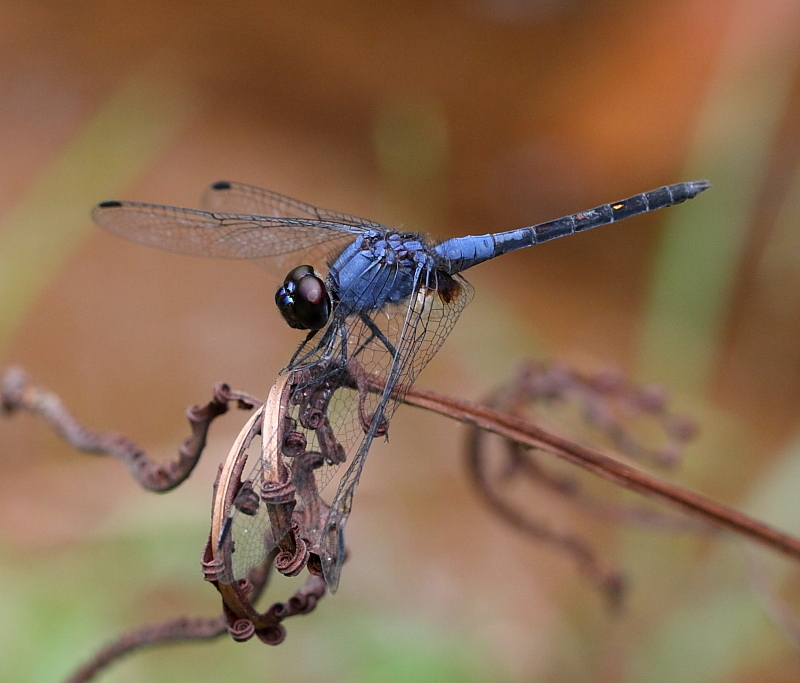 The thorax is dark-blue whilst the abdomen is lighter blue. 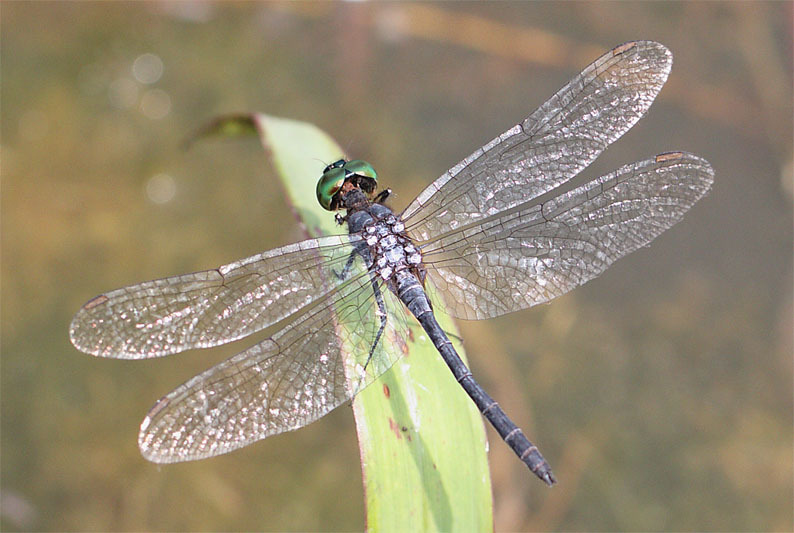 The extremities of the wing tips are tinted with dark-brown, and there is a dark patch at the base of the hindwings, a smaller one at the base of the forewings. 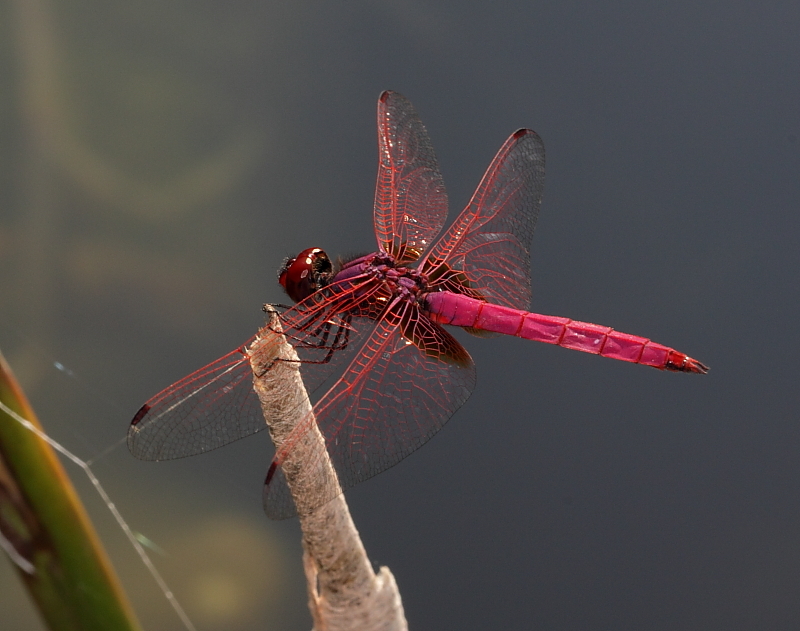 The males are very active in the early morning and midday, chasing away rivals whilst establish their territories. 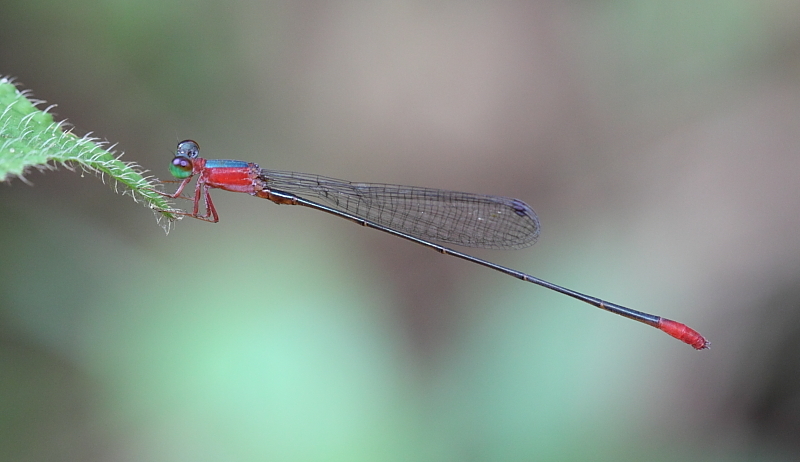 Female is paler, and so far, has not been observed in Singapore. 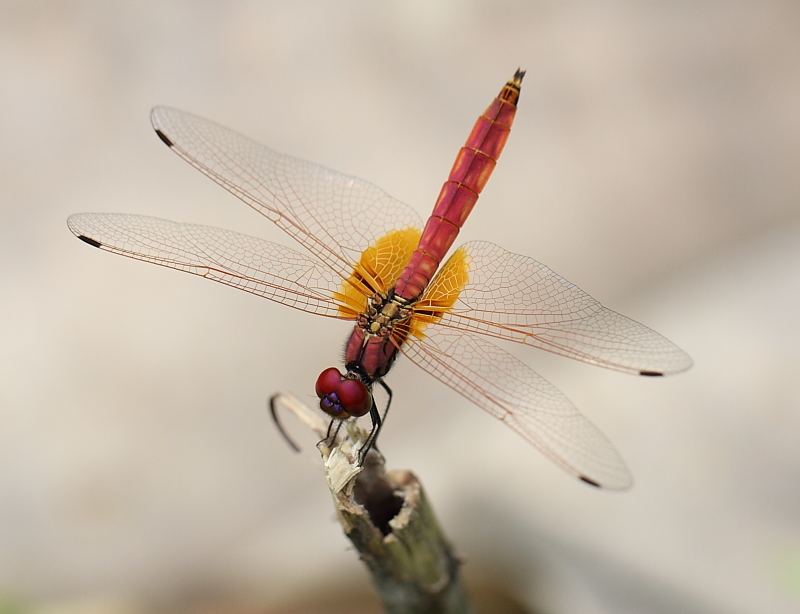 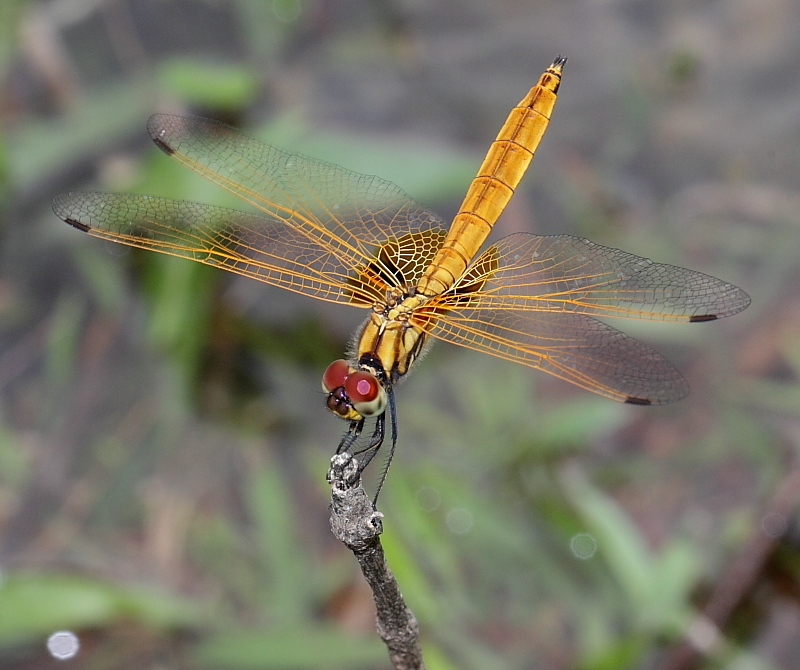 Trithemis festiva is a very attractive dragonfly which inhabits fast flowing streams through open grasslands. 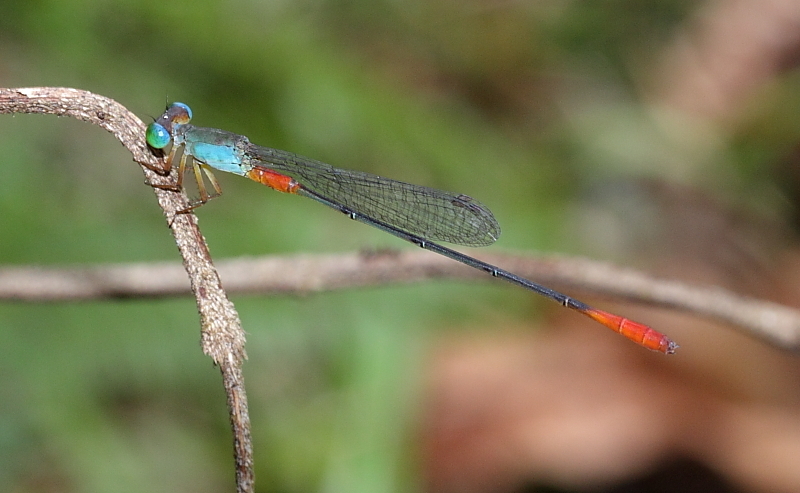 Male has dark blue synthorax and bluish abdomen with orange streaks. 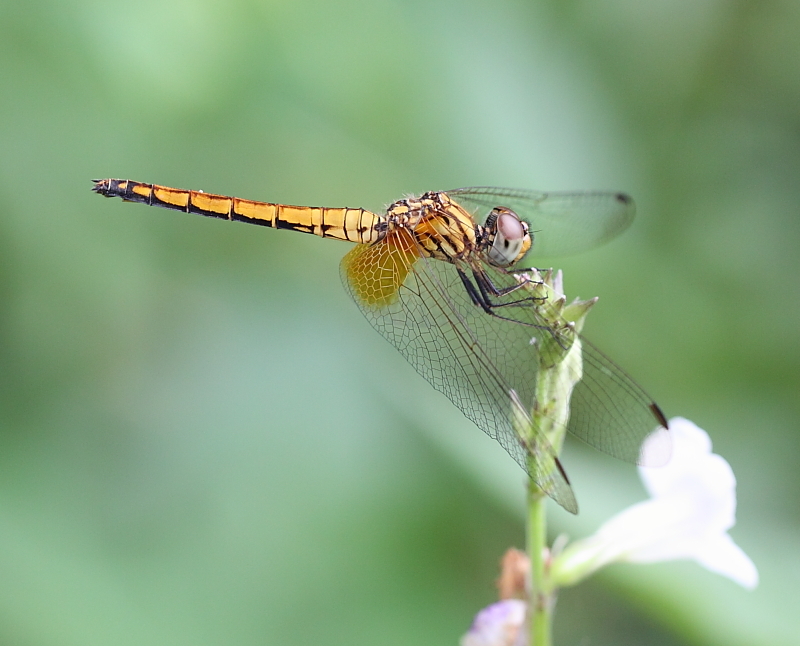 There is a brownish patch at the hindwing base. 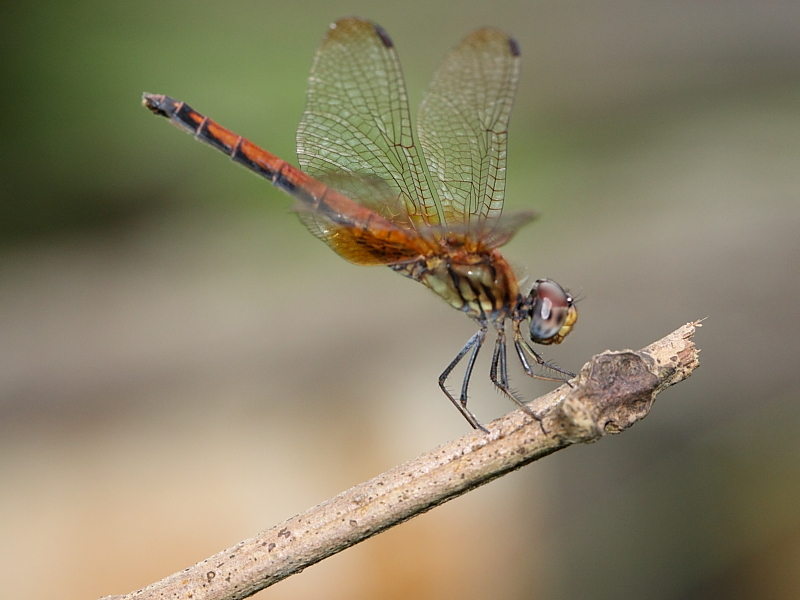 Superficially, male looks like Indothemis limbata, but lacks dark wing tips. 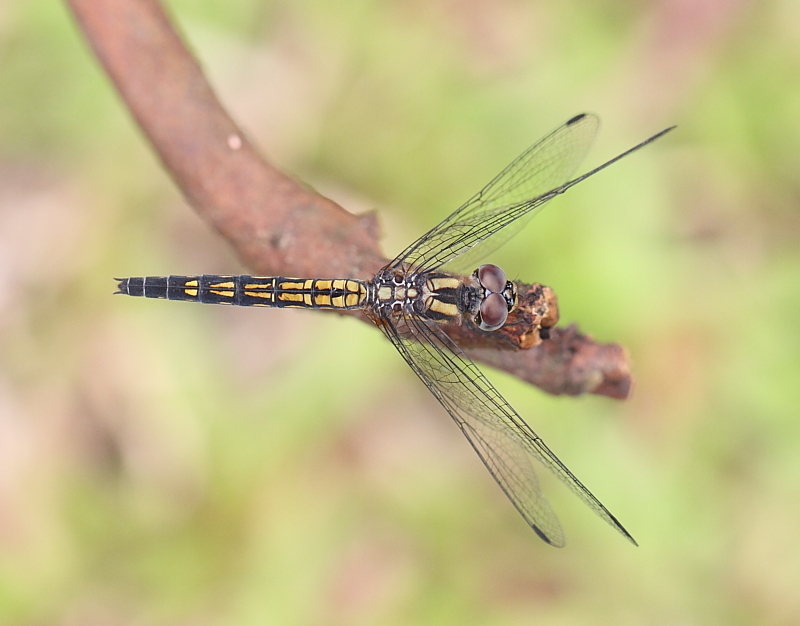 Female is brownish yellow with dark markings on the thorax. 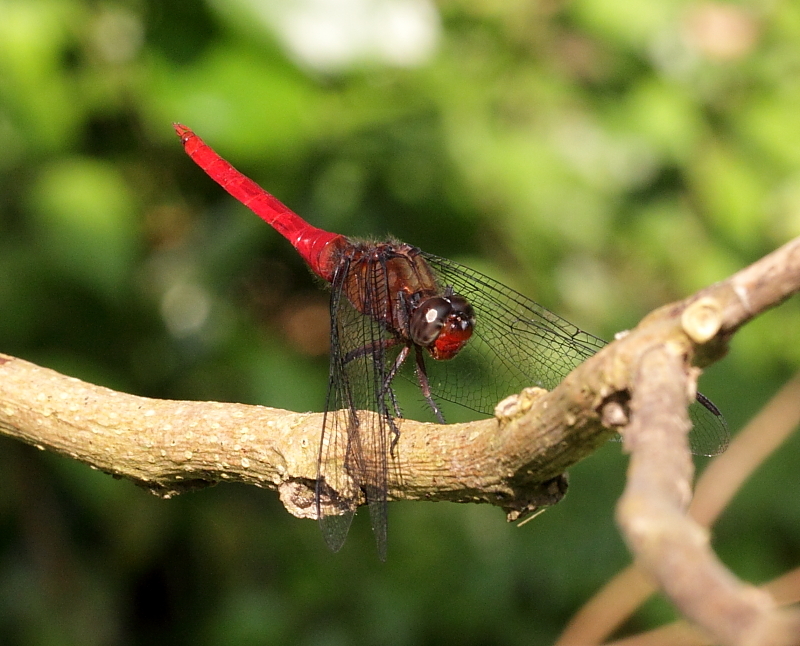 Females are often found inlands, tree tops and therefore rarely seen. 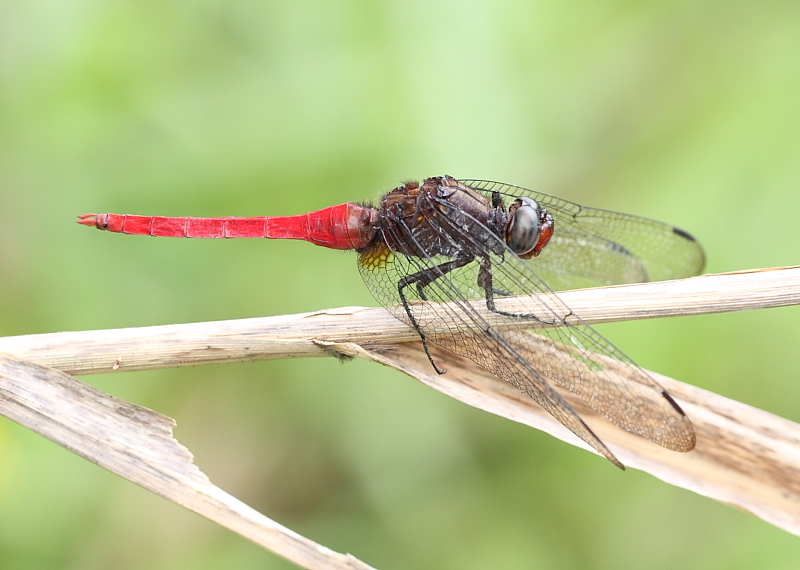 Orthetrum chrysis – the bee-eater dragonfly! 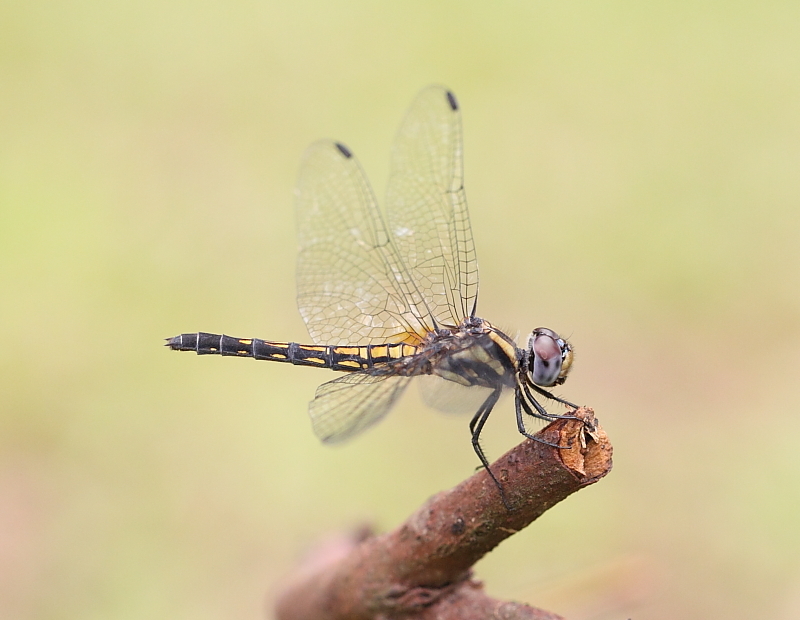 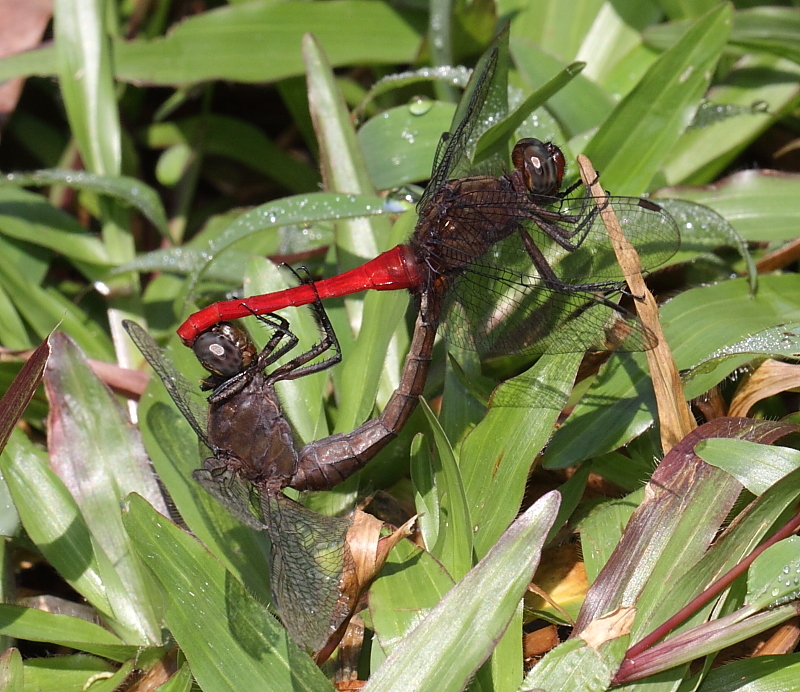 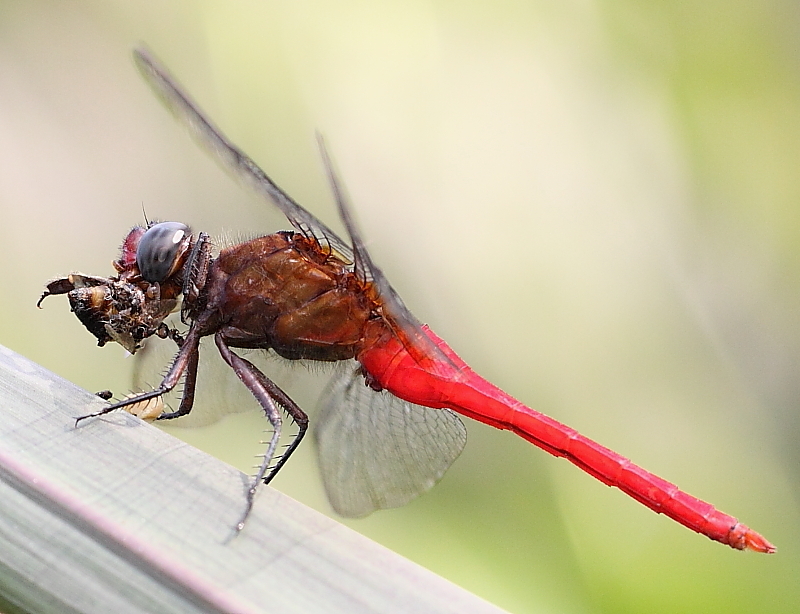 Spine-tufted Skimmer is among the more aggressive and voracious dragonfly that is quite common in Singapore. 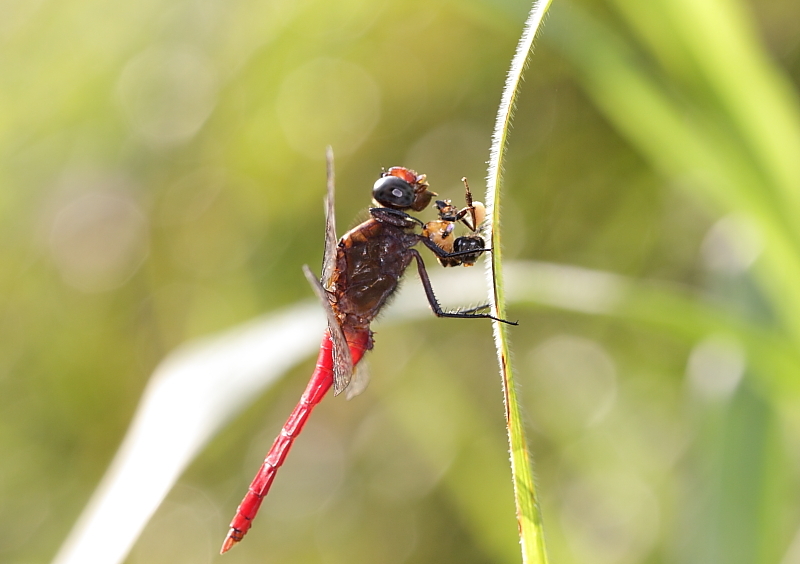 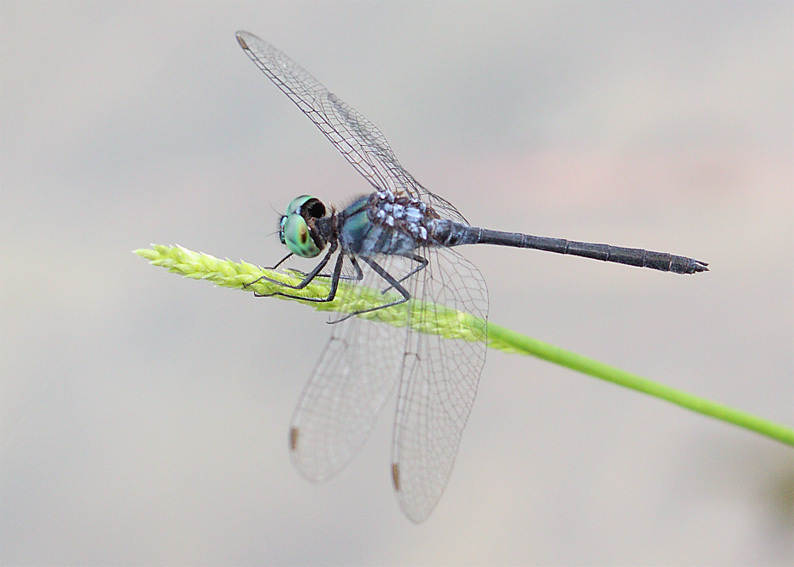 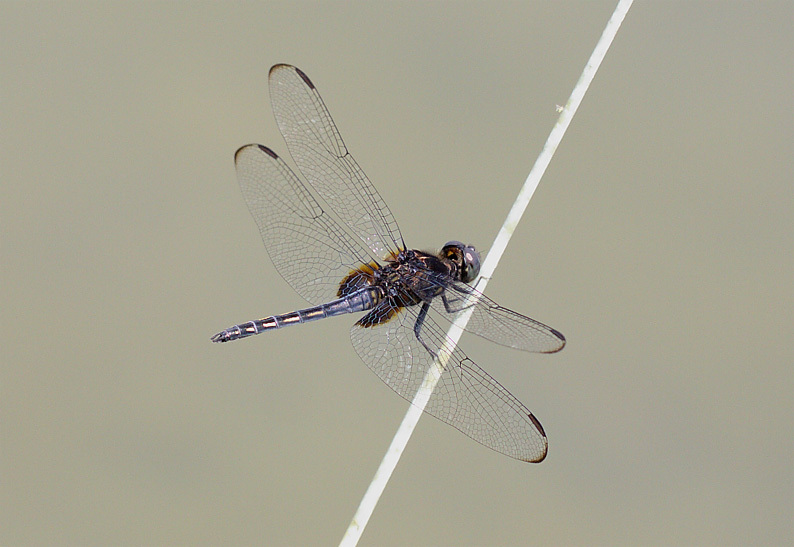 Dragonflies like Orthetrum sabina and Rhodothemis rufa are equally aggressive. 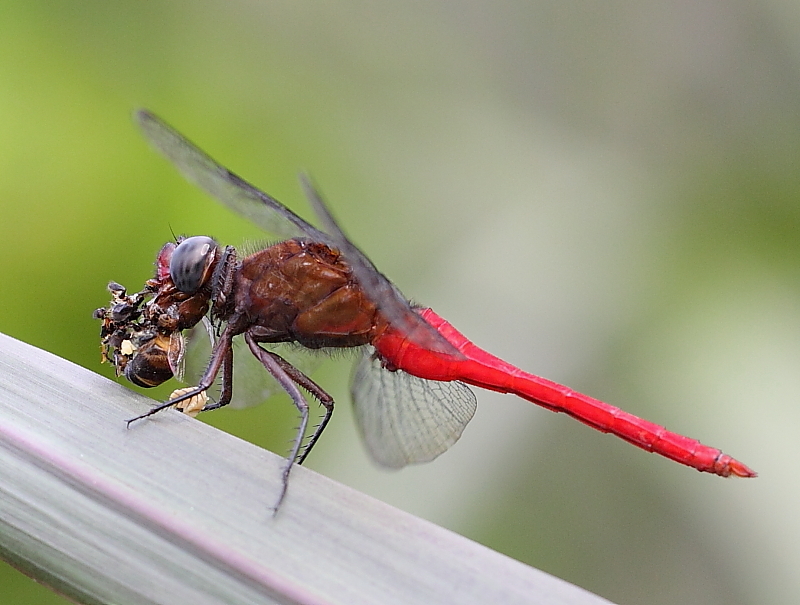 Unlike others, I think these spine-tufted skimmers have a preference for the taste of bees. 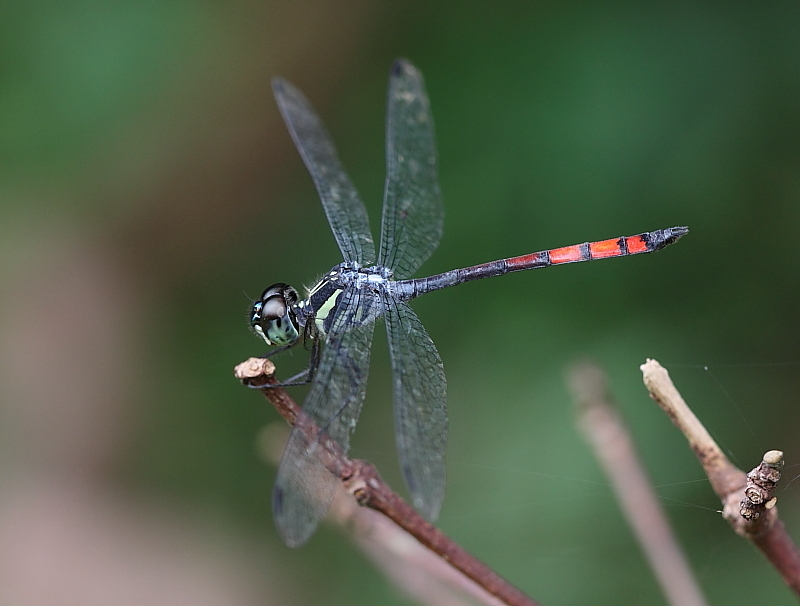 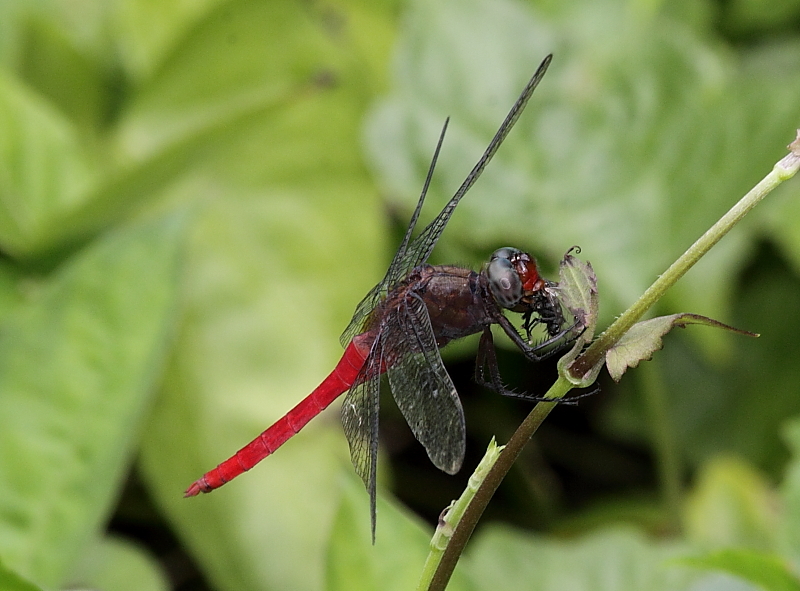 Red-tailed Sprite is moderately rare in Singapore, very localised and mainly found in marshes and forest pools at the Bukit Timah, and Central Nature Reserves. 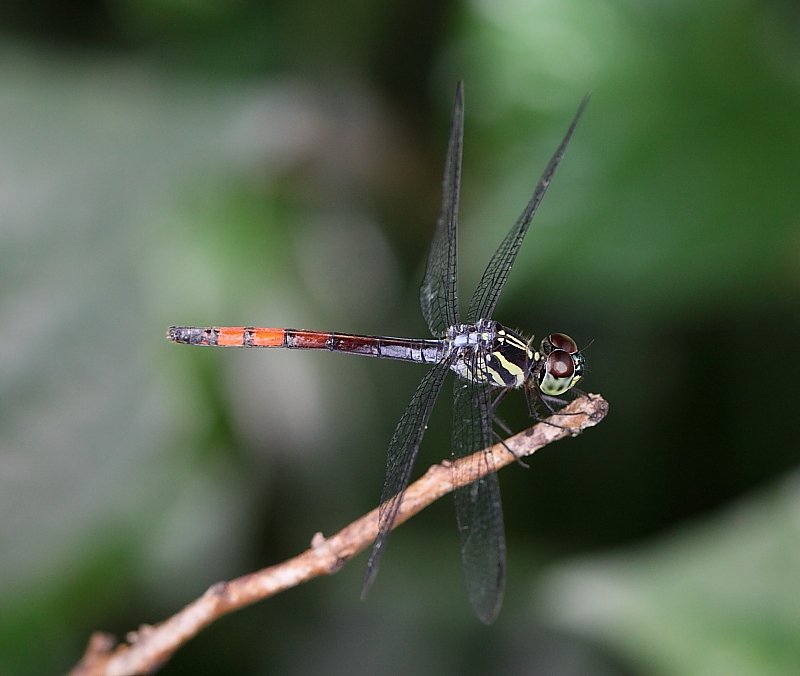 The male’s thorax is red with deep metallic blue-green band on dorsum of synthorax. 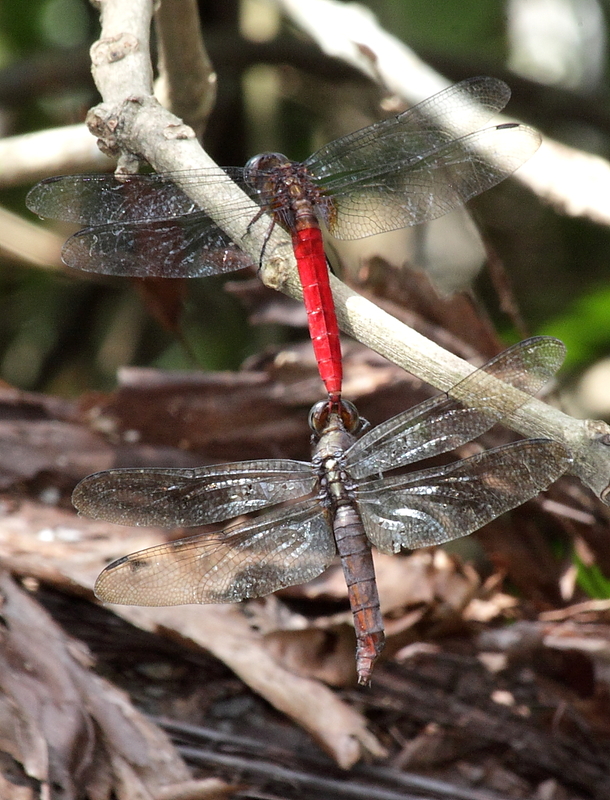 The abdominal segments from 8-10 is red. 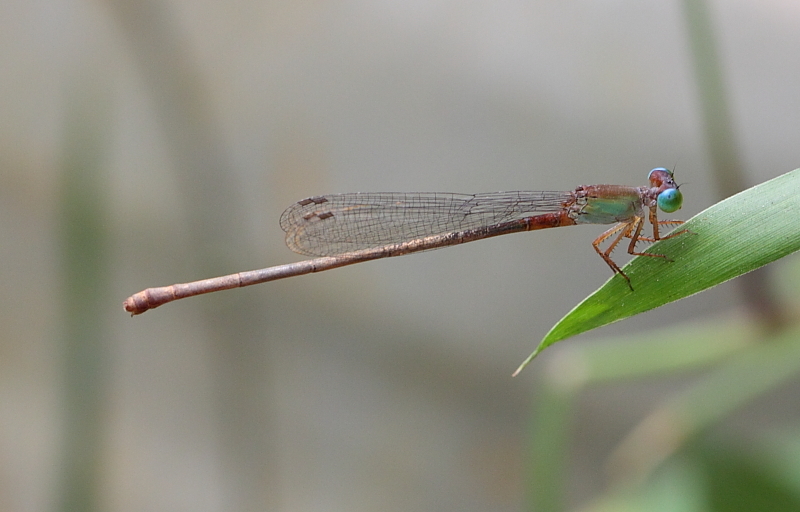 Female is similar but the colour is duller. 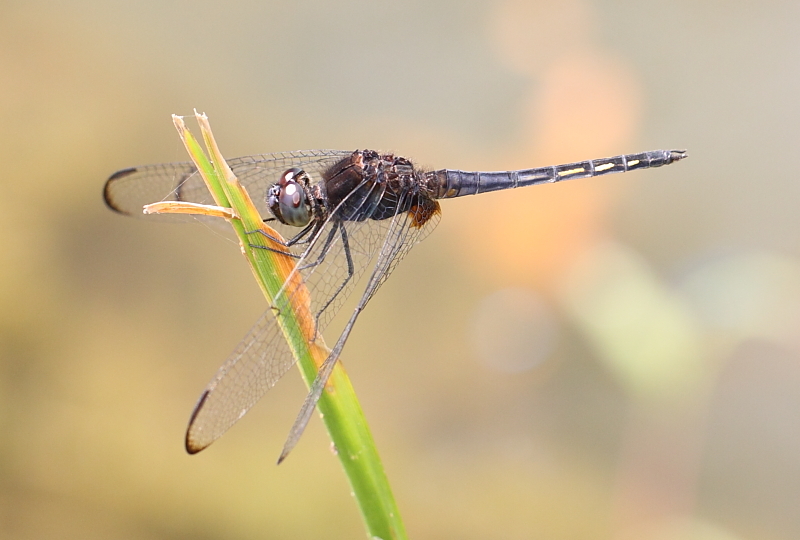 Males tend to perch very low near to water surface at forest swamp. 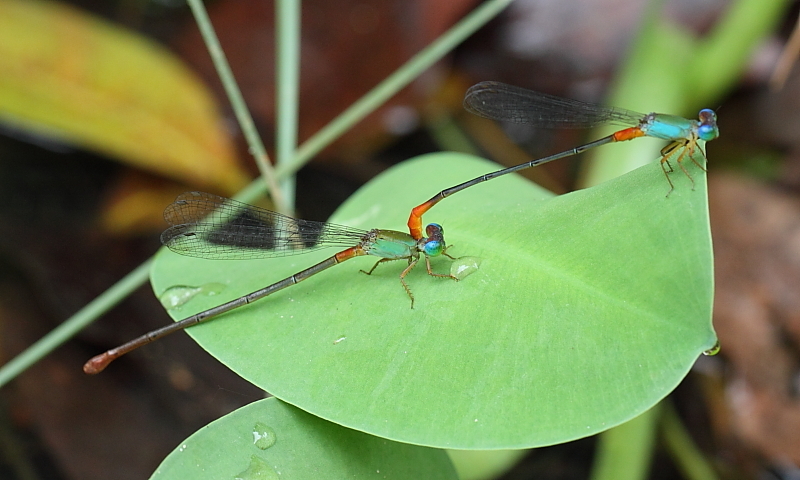 Female of this species is very rare.